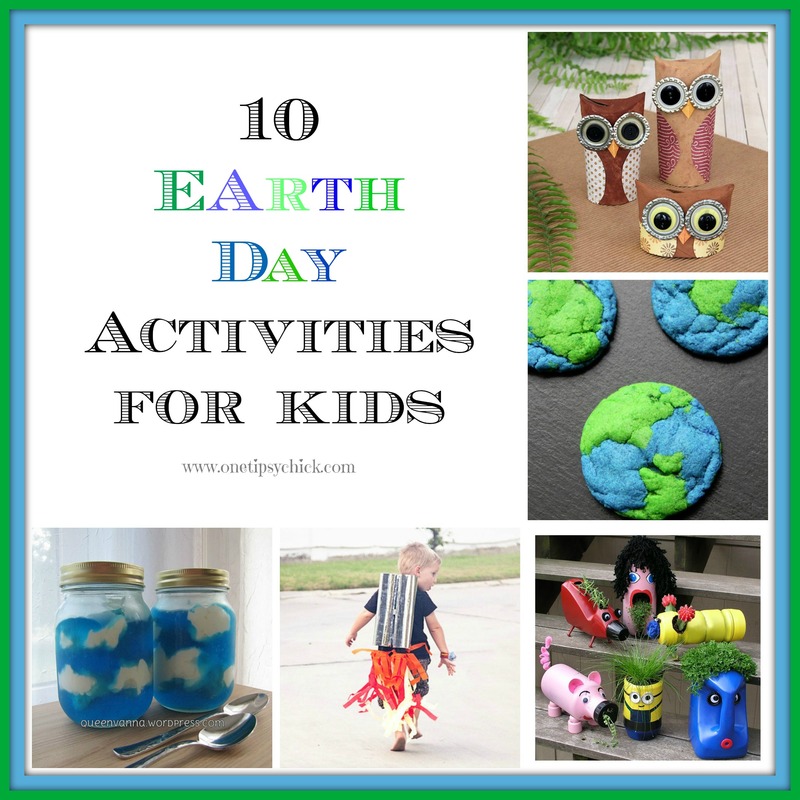 Earth Day is almost here and I am sharing 10 Earth Day Activities that are super cute and look fun to make! Some are edible and some use recycled items. I can’t wait to make some with my kiddos! Lets begin with these adorable Earth Day Owls that I found on E-How! They’re made with toilet paper rolls, craft paper, paint and bottle caps. Super cute! 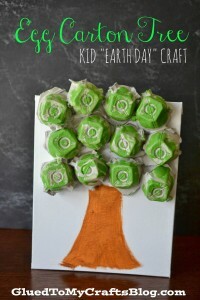 Earth Day Cookies by Tammilee Tips! Divide your sugar cookie dough in half. Use blue and green food coloring for each half and mix! Use a little of each dough to form 1 inch balls and bake! They came out great! How festive this would be for your kiddos and their friends! Cute Upcycled Planters for Kids found on E-how, shows you how to re-use empty plastic bottles to create these adorable planters. They can be decorated any way your kiddo desires, then once dry, add some soil and either some seeds or a small plant. The Rocket Blaster Jet Pack by Sewing In No Man’s Land looks like so much fun! What little kiddo wouldn’t want to jet pack around the house or yard with this?! Recycle your plastic water or soda bottles to make the jet pack, along with foil paper, streamers, glue and tape. Sky Cloud Jello by Queen Vanna looks so yummy! Your family will love this dessert made with blue jello and whipped topping. This can be made in fancy glasses, mason jars or small bowls. Next up are Homemade Earth Crayons by Sandy Toes and Popsicles. Don’t these look amazing??? So bright and colorful! 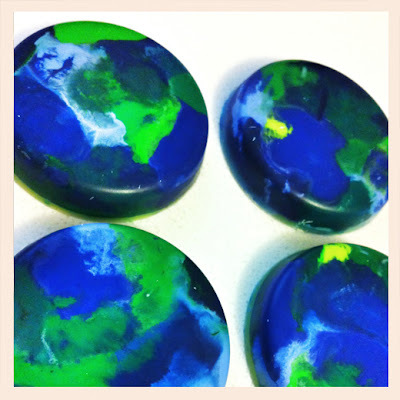 Re-use old, broken blue, green and yellow crayons to create these mini globes! LOVE! Plastic Ball Catcher by Lakeshore Learning. 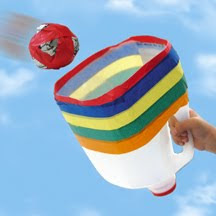 Use empty gallon milk jugs to make a fun backyard game. Just cut the bottom off the bottle and decorate. I would use tape along bottom to protect hands from sharp edges. Use tape and newspaper to make the ball. Recycled Daisies and Dragonflies by Art Is What I Teach. I love this site! My daughter loves to create art projects and we often look for ideas here. And there are SO MANY of them too! 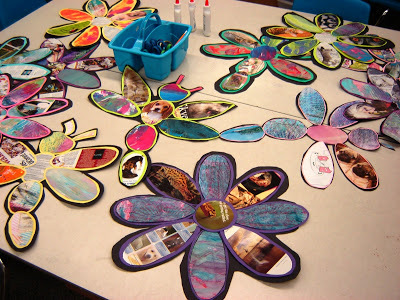 Here, recycled magazines are used to make these daisies and dragonflies. Pine Cone Bird Feeders by Our House. An oldie but goodie! 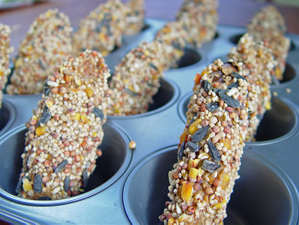 Kids of all ages love to make bird feeders, then hang them outside to see all the pretty birds that come to eat! Egg Carton Tree by Glued To My Crafts. You may still have some egg cartons around from Easter and this is a great way to recycle them! We didn’t get to make them either, but my kids thought they looked so fun!